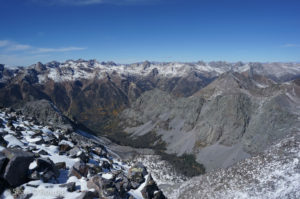 Mount Oso is the highest of a cluster of 13ers between Vallecito Creek and the Los Piños River in the eastern Weminuche wilderness. This remote area is most easily reached with a high-clearance 4WD from the Beartown trailhead. Without such a vehicle, I decided to approach Oso from the south near Vallecito Reservoir, using the new-to-me Los Piños River trail. I knew ahead of time that it would be a long outing, about 15.5 miles from the trailhead to the pass above Half Moon Lake. However, I underestimated both the difficulty of the cross-country portion in fresh snow, and the quality of the scenery along Lake Creek. 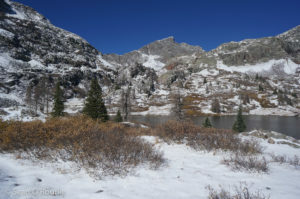 This maintained but little-used trail climbs through aspens past craggy granite peaks and mile-long Emerald Lake, by far the largest natural lake in the range. Knowing I had a long day, I got started by headlamp just after 5:30, hiking and jogging along the edge of the Granite Peaks Ranch. The pack trail continues up a narrowing valley north of the ranch, somewhat reminiscent the Vallecito Creek, though it seems less-traveled. With the previous day’s precipitation, the trail was somewhat boggy, and some normally-easy stream crossings were made more difficult by the ice that had accumulated overnight on the rocks. The trail eventually crosses Lake Creek on a sturdy-looking bridge, then splits, with my branch climbing a narrow side-valley that broadens and flattens as it turns north. After a long, cold climb, I reached the east shore of Emerald Lake as the sun slowly made its way down the opposite slope. 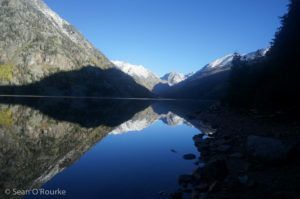 The lake sits in the flat bottom of an old glacial valley, dammed by either an old terminal moraine or a large rockslide. The previous day’s mixture of snow and rain had hardened overnight into a slick white crust, so it was slow going around the lake in my lousy flat-soled shoes (the better ones have all been destroyed). Above the lake, the trail shows less use from fisher-folk, but is still maintained as it tunnels through the head-high willows. I found a ford where it crosses Lake Creek, and a log hidden in the brush 100 yards upstream, with a vicious willow-whack required to get back on-track. With the snow melting in the sun, the trail became a sort of “anti-trail,” a muddy, icy stream worse than its banks. 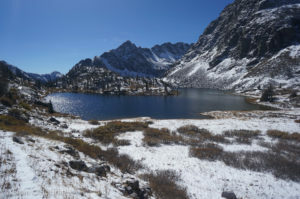 I continued along this path as the broad valley narrowed, then climbed steeply to roughly crescent-shaped Moon Lake, where the trail remained completely covered in about an inch of snow. 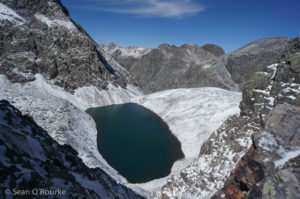 From there, the trail became even fainter as it climbed up to the pass above Half Moon Lake, a dot bearing no particular resemblance to a half moon. Looking east and north, I got my first views of Rio Grande Pyramid and the flat highlands between Silverton and Rio Grande Reservoir. I finally left the trail, climbing slightly toward Oso and hoping that a route would appear up the steep-looking headwall on the ridge ahead. 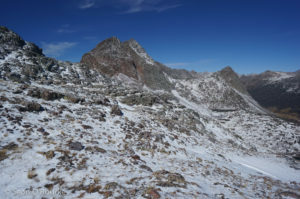 Things turned ugly near the intervening bump on the ridge, with maddeningly-slow loose talus covered in fresh snow. 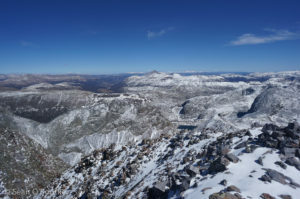 From the notch at the base of Oso’s northeast ridge, I got a look at Lake Mary Alice, sitting like Lake Silex at the bottom of a hostile-looking talus-bowl. The third class climbing along the ridge featured a couple surprisingly steep gashes, and was made much trickier by the fresh snow. In particular, one sloping slab that I would have walked across without thinking became a thought-provoking hand traverse. Just below where the ridge joins the broad south face, it becomes a near-vertical face split by two right-to-left ascending ramps. Partway up the first ramp I could have cut back right to the second. I chose instead to continue on the first, and was rewarded by finding a cairn where it turns the corner onto the southeast face. 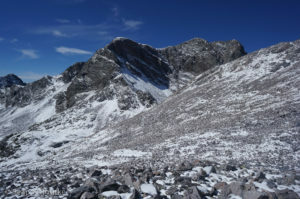 From there, a mixture of grassy ramps and class 2-3 scrambling led to the south face, where faint goat trails led toward the summit. After a cold morning, I was pleased to find the summit sunny and calm enough not to need my windbreaker. To the west, the Needles and Grenadiers rise nearby across Vallecito Creek. Rio Grande Pyramid dominates the view to the east, while Vallecito Reservoir and the plains of northwest New Mexico are visible to the south. Rather than retracing my route, I descended the ridge to a red gash, then dropped southeast directly to Moon Lake, avoiding both most trickiness on the ridge and the miserable talus. My shoes sucked as expected on the steep, snow-covered grass, but I reached the trail without any mishaps. Most of the crusty snow had softened or melted, replaced by more mud and water, so it was again slow going until below Emerald Lake. Finally on reasonably-dry trail, I had some ibuprofen and started the jog home. My legs were somehow still a bit stiff from my race a few days before, so I was more inwardly-focused than usual as I turned toward the bridge at the trail junction. I was startled back into reality by some couple’s dog acting half-heartedly aggressive. 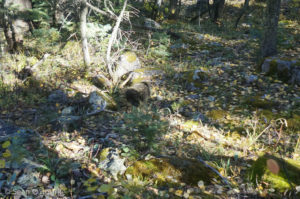 Freshly attuned to my surroundings, I noticed a porcupine a short distance down the trail, and darkly hoped that the unleashed dog would find it as well. 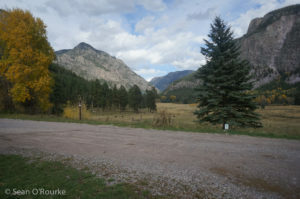 Since this river trail sees much less horse traffic than the Vallecito, it is actually a pleasant, slightly-downhill run, and I was making decent time toward the trailhead as I passed a man and his dog decked out in hunter orange. 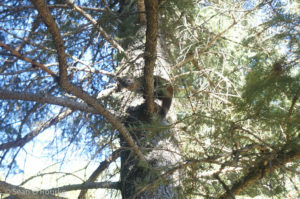 A few minutes later, I saw something scamper squirrel-like up a tree near the trail. It turned out to be an American marten, a cute little creature I had only seen once before in the Tetons. I stopped for a few minutes to take pictures as the creature looked down from a branch just out of reach, and the man with the dog caught up again. I was feeling more tired than expected, and was in no particular hurry to reach my car, so we walked together and talked for the remaining miles to the trailhead. I had planned another long-ish day in the area, but was feeling less than enthusiastic, so I found a nearby place to camp; I would decide what to do in the morning. This entry was posted in Colorado, Type II fun. Bookmark the permalink. Sean, I went for Oso the day before you man on Tuesday the 4th from the Vallecito side. It was supposed to be a sort of summer’s over, lets see if I can do this in a day kinda trip. The plan was to head up Irving Creek, but my partner bailed at mile 7 at the river crossing waiting for the sun to come up so we could see what we were in for. I flipped. Nice work out there. You’re an animal! I’m definitely gonna do it again in 2018. I like your method. Happy holidays. The Los Piños is definitely the way to go for Oso — I did the early morning Vallecito crossing for Jupiter, and it was thigh deep and sort of miserable. Plus, there’s zero bushwhacking vs. what could be a couple thousand frustrating feet up Irving Creek, and Emerald Lake is worth a visit. Hope you’re having a better winter up there than we are down in NM. The skiing is pretty sad.